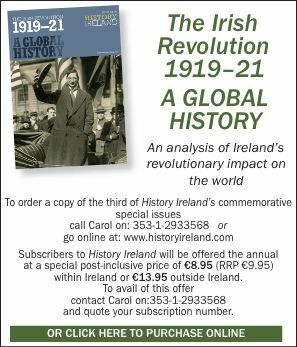 In the summer of 1925, just two years after the IRA’s defeat in the Civil War, the organisation sent a delegation to Moscow to solicit finance and weaponry from the Soviet Union. According to Tim Pat Coogan, the Russians asked their guests, ‘How many bishops did you hang?’, and when the answer was none, they replied, ‘Ah, you people are not serious at all’. The group was led by the well-known Cork gunman P.A. Murray, who met privately with Joseph Stalin. Though Stalin expressed reservations about the IRA’s determination and competence, soon afterwards both parties made a secret agreement: the IRA would spy for the Soviets in Britain and America, as well as support their strategic goals, and in return receive a monthly payment of £500. Soon after approving the pact, Frank Aiken (a loyal lieutenant to Eamon de Valera) was ousted as chief-of-staff and replaced by Andy Cooney, who in turn handed over command to Moss Twomey. For the next few years Twomey, in collaboration with his close associate Cooney, oversaw the IRA’s relationship with the Soviet Union. This remained one of the organisation’s most closely guarded secrets, and reference to it was rarely made in writing, except in secret code, and even then often in a very cryptic manner. The IRA was in contact with Red Army intelligence officers in London and New York, and it was in the former that the monthly stipend was handed over. The IRA’s senior officer in London passed along military intelligence, including specifications of British submarine detection sonar and aeroplane engines for bombers, military journals and manuals, and gas masks. In addition he arranged false passports for Soviet agents and even for a communist operative to travel to Romania in the guise of an Irish woollens salesman! It was in New York, however, that the Soviets got the most valuable information, from an IRA agent code-named ‘Mr Jones’. Jones’s sources likely included serving members of the US military, as he was able to provide reports of the army’s chemical weapons service, state-of-the-art gas masks, machine-gun and aeroplane engine specifications, and reports from the navy, air service and army. In Jones’s estimation, Soviet intelligence in the US would have been ‘helpless’ without the information he supplied. At this time the Russians feared a British-supported invasion of the Soviet Union and they asked Jones to plan for the sinking of British merchant ships sailing from New York to England in the event of war. Jones reported to Moss Twomey in Dublin that ‘under the excitement of war conditions we could get almost all our men to do anything, but could not give any guarantee that we could avoid casualties in killed and captures [sic]’. In Twomey’s opinion, ‘destruction may be feasible, if it could be done secretly and without capture of our agents’. One of the more bizarre consequences of the agreement was the IRA’s attempts to support Soviet interests in China. The Russians were heavily committed to Chiang Kai-shek, who was allied with the Chinese communists and engaged in a struggle with the warlords, who in turn were supported by Japan and Britain. The IRA army council resolved that ‘the principle of [IRA] volunteers going to China was approved, provided conditions of service [and] cost of travel were satisfactory’. Meanwhile, the Scottish IRA battalion claimed that it had sent 200 bombs to China, and Twomey ordered the IRA unit in Liverpool to destroy arms ships sailing from there with munitions for the warlords. Though the Soviets had little intention of supplying weaponry to the IRA, individual Red Army intelligence officers continued to hint that they could be provided. Jones reported that his contact promised ‘to give us all the material we needed’. Additionally, the Russian officer passed along to Jones information on mustard gas. Both the Russians and the IRA had different reasons for consummating the relationship. Moss Twomey saw the agreement as a way of getting money and possibly weapons. Although there were a number of influential Marxists among the IRA leadership (most notably Peadar O’Donnell), Twomey’s interest was utilitarian rather than ideological. The Russians for their part wanted information on British and American weapons technology and hoped that the IRA would help promote pro-Soviet policies in Ireland and abroad. They avoided arming the IRA lest the weapons be captured and traced back, as they both feared Britain and needed to keep it as a trading partner. Moss Twomey wrote of the Russians: ‘these people are so shifty . . . they are out to exploit us . . . Except for our urgent need of cash, I would not be so keen on this [agreement]’. Frank Aiken referred to the Soviets as ‘hopeless bunglers’. In November 1926 the Russians abruptly decreased the monthly payment to £100, having complained about the quality of work the IRA were doing for them in London, but also blaming the financial crisis in their own country. Considering that it took £400 a month to run the IRA, this was a major catastrophe. With Moss Twomey imprisoned in Mountjoy, Andy Cooney rushed to London to meet with the Soviet intelligence officer there, but to no avail. In the coming months the IRA had to let go most of its full-time officers, while many of those who remained at GHQ were unpaid. In order to put pressure on the Russians, ‘Jones’ was ordered to hold back on the intelligence he supplied in New York. Eventually in May 1927 the Russians handed over £1,000. In November 1927 an IRA army convention pledged military support for the Soviet Union in the event of an Anglo-Soviet war, and in 1930 a senior IRA officer, Seán MacBride, reported the possibility of ‘substantial’ aid from Moscow as well as the opportunity for IRA officers to receive military training there. Around this time, however, the Soviets backed away. The Soviets were happy to have the IRA spy for them, but were very wary of being drawn into the organisation’s ‘terrorist’ plans. Or, as a Soviet agent in Holland, Ignace Poretsky, complained, the IRA ‘were convinced that their own problems were the world’s most important’. The IRA’s lack of both subservience and ideological correctness made them unsuitable partners for the Soviet Union and it was time for Moscow to move on. And so ended one of the IRA’s best-kept secrets. Tom Mahon is a consultant radiologist based in Honolulu and Galway.